Ever been stuck in a decision? One where perhaps you’re discerning a better and best more than a right or wrong? Or, perhaps you are making a wise vs. stupid decision, but you aren’t sure which side of wise or stupid you are on. :-) Some decisions clearly do carry a right and wrong choice, as defined by God. And others, if not carefully pursued, can begin innocently and yet end up badly. Also, there there are those that can end up being better or best–decisions we don’t want to miss making. A question I’ve been mulling around in my head and heart over the past week or two is not (in the best of my Bible reading, praying, discernment and advice seeking over the last couple of weeks) one that has a right or wrong attached to it or is of utmost importance. It’s really only about writing, and how much extra time (beyond my already very busy job) to devote to this hobby I quite enjoy. Beyond books, (which is my main focus in this hobby) I am continually learning that there’s so much more I “could and should” learn to do with blogs, social media, etc. to enhance the ability to get the message of these books out there. But alas, there are only so many hours in a day. I need to decide just how much extra time to spend on these things. I also have a few Christian friends who are currently making some decisions of a different nature. 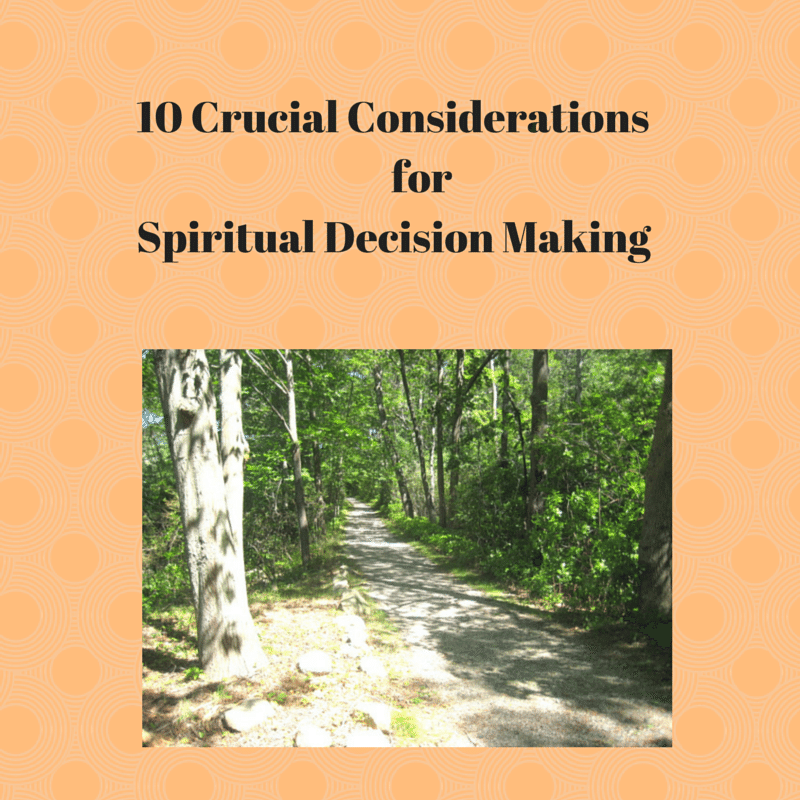 As a result, I put together a few questions I’m asking myself concerning spiritual decision making. Let me know any others you consider, as well as how these considerations may have helped you make decisions. One request. Please stop and read the scriptures, for they are the real meat in this little list. And also remember that our decision making influences others’ lives whom our lives touch.. This was an observation my five-year-old grandson stated after his Saturday outing. 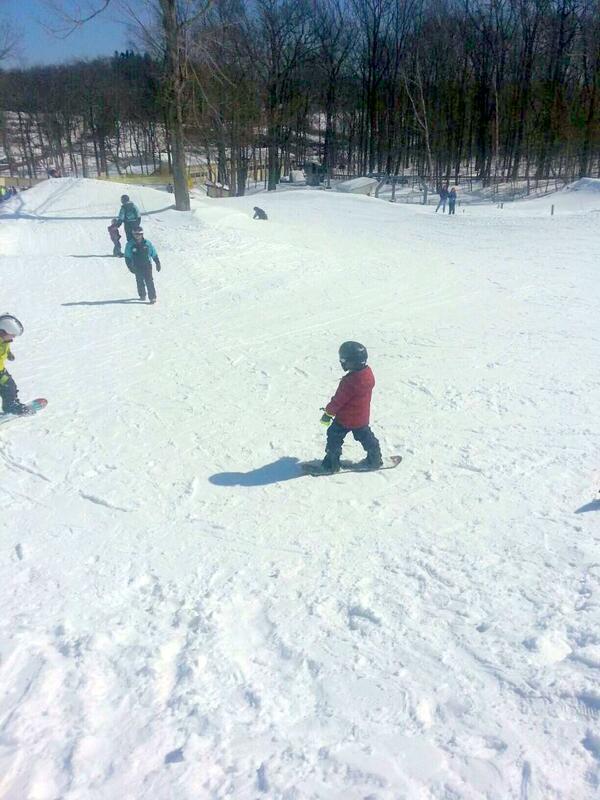 I love that he thought about his dad, who loves snowboarding. I also love that he loves words, so I wasn’t surprised at his use of this particular one. It’s a big word with a big meaning. Think about your day. Does it ever go like this? A big word with a big meaning. Consider your choices and consider their consequences. It can change you and can potentially change the world. Stop. Think. Follow God’s Word. Pray. Get open as you seek wise counsel. This past week I “drank from a fire hydrant.” At least that’s what it felt like as I took in so many powerful and wonderful lessons in a short amount of time. I returned from the World Discipleship Summit today convicted, thrilled, moved, inspired, renewed and exhausted! Yesterday, as nearly 18,000 disciples sang “Men Who Dream” tears of joy kept flowing down my cheeks. I am quite sure God is not through with us and I’m so eager to see God do more than I dare ask or imagine. (Ephesians 3:21) And, I’m eager to let God use my life for His glory. Processing a week like this will take prayer and time. It’s funny how things can sometimes come together in unexpected ways. The Summit came together for me on the way home today. I decided to watch the movie offered by the airline, as it seemed light and fun – and my brain needed a rest. 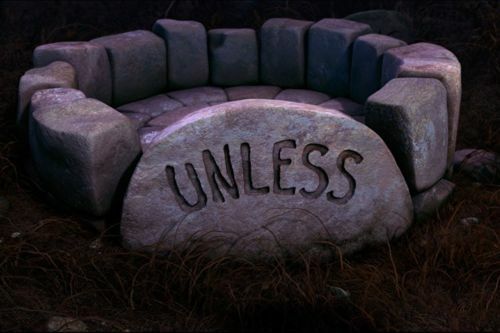 As I watched the Dr. Seuss film, “The Lorax,” I realized that the simple message from this little film honed my many thoughts. Though it sends a message about the environment, it left with me more of a moving, spiritual application. I tell you, no! But unless you repent, you too will all perish. Jesus answered, “I tell you the truth, no one can enter the kingdom of God unless he is born of water and the Spirit. Jesus said to them, “I tell you the truth, unless you eat the flesh of the Son of Man and drink his blood, you have no life in you. I tell you the truth, unless a kernel of wheat falls to the ground and dies, it remains only a single seed. But if it dies, it produces many seeds. Remain in me, and I will remain in you. No branch can bear fruit by itself; it must remain in the vine. Neither can you bear fruit unless you remain in me. I decided to take this word personally, realizing that it also applies to me. “Unless” I care a whole lot…I can’t make things better. Oh my! What did I get myself into?! Have you ever been faced with a decision you made….and later thought – “What in the world was I thinking? 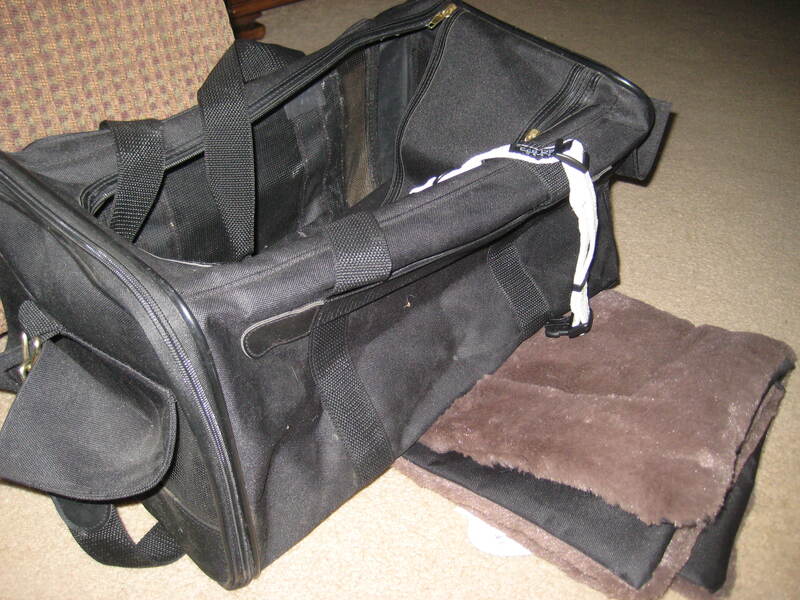 !” Last night, as I gathered a travel crate, blanket and puppy collar for packing, I felt a bit of fear and trepidation. In fact, I felt more than a “bit”. You see, “dog life” has gotten quite easy over here. Our little ten year old cockerpoo goes out once in the morning and then again at night. We don’t even have to walk outside with him if the weather is bad. Meanwhile, he just wanders from the sofa to his little bed, circling each place a few times until he settles on the best spot for a nap. Wyndham leaves for a meeting this afternoon and plans to come back in a couple of days with a little something in that travel crate I mentioned – an eight week old puppy full of life and energy. I have found myself wondering what in the world I agreed to- and what insanity entered my mind to do this again?! My “easy dog life” is about to be over. I must confess I felt a slight sense of panic. In my future I am seeing several weeks of puddles and worse, perhaps a chewed chair leg or two along with some mangled toys that were intended for the grandchildren’s play. I’m sure there will be lots of hair for daily vacuuming, vet bills.. and if we are fortunate to have many years with him…another heartbreak twelve to fourteen years from now. So, why in the world would I do this? Because the sheer joy he will bestow on me when I come in the door after being gone; the eagerness he will have to please us; his ability to love unconditionally; his longing eyes and cute antics; his energy and zeal; his head that will rest on my knee, and most of all his devotion as a loyal friend will make it all worth it. It’s really about the relationship between a “man and his dog” and a “woman and her dog”. So, having made a deposit earlier, I just wrote a check for the remainder of the payment. I sighed a bit, but then smiled. To us, he is more than worth the cost. We weighed it, and considered it long and hard. I’m sort of glad we had to put a deposit down. It helped me keep my resolve. When something doesn’t cost me anything, I am more apt to back out. I made a wholehearted decision. If I had kept wavering in indecision I would be miserable, and I would fail to enjoy this soon-to-be reality of a new puppy. I can already “feel” his cuteness. On a far weightier matter, I made a decision many years ago, when I was a teenager, to become a Christian – a follower of Jesus. Since I came out of the waters of baptism there have been many exhilarating times, numerous challenges, victories and defeats. I wouldn’t trade this life for anything. I made a big decision to turn my life over to Jesus’ care and direction…yet he made the far bigger deposit – his life. That deposit, and the one he gave me of his spirit living in me, have helped me keep my resolve to follow Jesus. – with no turning back! Then he said to them all: “If anyone would come after me, he must deny himself and take up his cross daily and follow me. For whoever wants to save his life will lose it, but whoever loses his life for me will save it. What good is it for a man to gain the whole world, and yet lose or forfeit his very self? A decision to turn back would not only cost my salvation – but would also affect others who see my life. Most of all….I would miss out on the most amazing benefit; a relationship with God that gives me forgiveness, friendship, family, purpose, identity, acceptance, fullness of life and so much more. This relationship has such an amazing effect on all of my other relationships. I love this relationship that “I got myself into!” Oh my! As I write this my husband is preparing sixty pounds of cod and haddock filets. Tomorrow night we will have a fish fry with our family group. The remainder will go to friends, family and the freezer. Two days after Christmas Wyndham went deep sea fishing and caught so many fish that his hands were cramping from the strain of pulling them all in. (It might have also had something to do with being out on the ocean during winter in New England during high winds and 4-7 foot waves as well). He had a blast! I was so happy for him, and I have to say – the fish tastes pretty fantastic! I wish I could enjoy this sport with him. However, if someone wanted to torture me they could wake me up in the wee hours of the morning, load me on a boat and take me fishing. No need to chum for fish… I’d automatically provide the chum. I can get sick just looking at a wave. It hasn’t always been this way. When I was a young girl, I loved to fish for brim and bass in the pond in my back yard. I caught fish on bread wads, bacon – and once while using bubble gum for bait. I never could do the worms, however. They were just too slimy for me. I fished day after day and loved it. However, something happened between now and then. Today, I could enjoy about 10 minutes of fishing if I was standing on the ground by a beautiful lake with the air temperature about 72 degrees Fahrenheit… and a gentle breeze was blowing to keep away the bugs. Someone else would bait my hook…I’d catch a fish instantly and then they would also take it off the hook for me (and throw it back). It would be nice if a tasty picnic lunch was there to enjoy as well. I could munch on this while I stared at beautiful mountains in the background overlooking the lake. That would be okay. I know what happened….. Shortly after we were married I went deep sea fishing with Wyndham and his uncle (who loved fishing as much as he did). It was raining and the waves had deep swells. I turned green and went down to the cabin in order to stay dry while I threw up. That proved to be a bad idea. My sea-sickness got worse and worse, so I ventured outside to sit in the rain and hurl over the side of the boat. As I sat down in the rain …. his uncle began chumming ( putting whole fish..guts and all in a meat grinder to dump in the ocean to attract fish. That helped…(not so much.) His uncle then gently put a tarp over me and assured me that we would turn back when the tide changed. (He was the boat captain so made the decisions.) When I learned that the tide would change in six hours I seriously contemplated the decision to throw myself overboard. Ever since that day, I have stayed far away from fishing. It was a fast and firm decision. I’m not even tempted to try it again. 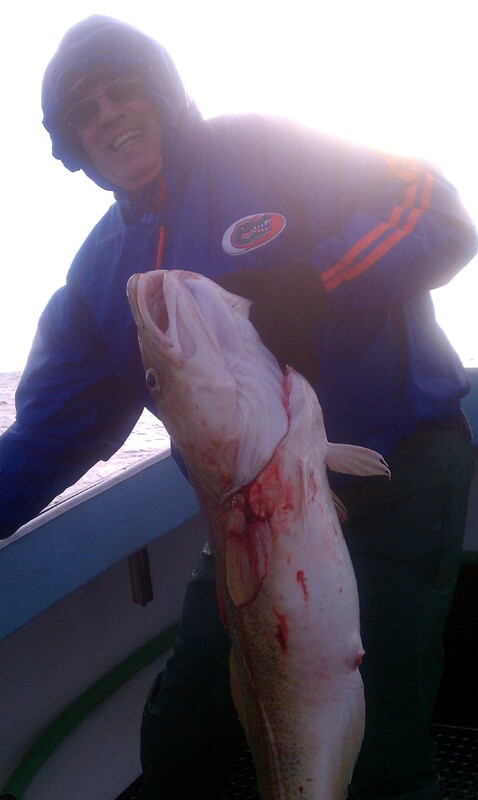 I don’t want to get close to deep sea fishing…it made me completely miserable. I thought about two scriptures I read today. Flee the evil desires of youth, and pursue righteousness, faith, love and peace, along with those who call on the Lord out of a pure heart. Don’t have anything to do with foolish and stupid arguments, because you know they produce quarrels. Do not love the world or anything in the world. If anyone loves the world, the love of the Father is not in him. For everything in the world–the cravings of sinful man, the lust of his eyes and the boasting of what he has and does–comes not from the Father but from the world. The world and its desires pass away, but the man who does the will of God lives forever. Every day…from the mall to the television the world tries to lure us with money, things, pleasures and all sorts of distractions from what really matters. Satan is chumming for our attention and wants us on his boat. That boat ride ends very badly. May I (and we) always remember how empty and deceitful the world really is and stay as far away as possible…not setting foot on that boat. Rather,… pursue faith, love and peace…with a pure heart. These will not disappoint.